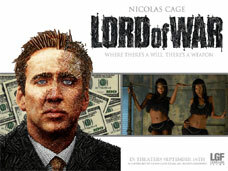 Writer/Director Andrew Niccol exposes another side of war in Lord Of War, a film in which Yuri Orlov (Nicolas Cage), an arms dealer, brings tragedy to his wife, his brother, and himself by selling weapons of war. The screenplay dramatizes the factual nature of the international arms trade, defines the character traits of an arms dealer, and shows the consequences of selling weapons of war. The main character of the story, Yuri Orlov, is an immigrant who lives in New York. There, he pursues his love interest, a woman named Ava. He also seeks a better life for himself and his brother, Vitaly (Jared Leto). Togther, they start an international arms dealing business. The business is profitable but fraught with danger. A competing arms dealer wants to stop Yuri, as does Jack Valentine (Ethan Hawke), an Interpol agent. Ethan Hawke, the actor who plays Jack Valentine, says: "The truth of the matter is that this country (the U.S.A.) makes a lot of weapons and we sell a lot of weapons. And we sell them to a lot of poor people who kill each other with them." Yuri Orlov, the man who Jack Valentine chases, is a struggling immigrant whose unsatisfying lifestyle in Brighton Beach, New York, motivates him to sell weapons of war with his brother, Vitaly. Jared Leto, the actor who plays Vitaly, says: "Yuri is an anti-hero. He's a ruthless and morally bankrupt person, but he still has humanity." Yuri reveals his humanity through personal relationships. He marries a beautiful woman named Ava Fontaine (Bridget Moynahan) and has a child with her. Yuri cares about Ava and his child, Nicolai, but doesn't tell Ava that he sells weapons. In one scene, Yuri says: "Some of the most successful relationships are based on lies and deceit." In commenting on her role as Ava, Actress Bridget Moynahan says: "At the wedding, [Ava] admits she knows [Yuri] has a sort of double life going on… She accepted the situation. There's an incredible bond and loving relationship between [her and Yuri]." That bond is eventually broken when Yuri lies to Ava and takes his brother, Vitaly, to Africa to sell weapons. Vitaly is killed during the arms deal. Yuri then suffers the consequences of his actions. He's abandoned by Ava and his parents. "The main thing is that the road to hell is paved with good intentions, and the devil [Yuri] is a great guy. So, [as Yuri,] I'm just a good guy with good intentions," says Nicolas Cage. The cast members of Lord Of War were impressed by the quality of the screenplay and the way the characters were developed in the script. Nicolas Cage says, "…[the script] seemed to be so unlike anything else. It had a unique and original story, and it's an inside look at what I think is the reality of the gun trade." Actor Jared Leto agrees. "When I read the script, I was really surprised because it's part political, [part] social commentary and part character study of this arms dealer, and it's something I've never seen on film before." When Lord Of War opens in theaters on September 16, 2005, audiences will get an inside look at the life of an arms dealer and the reality of the international arms trade.